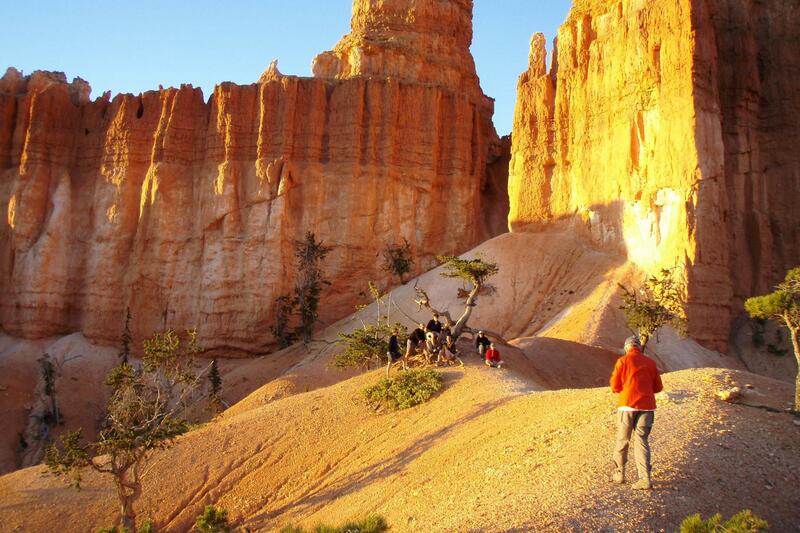 Enjoy cycling through at Bryce Canyon and along scenic Utah Highway 12 through the wild landscape of Escalante National Monument. 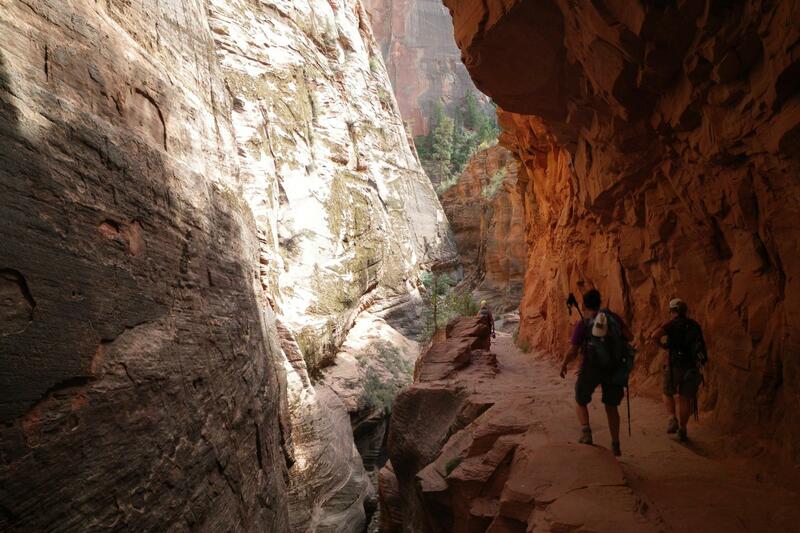 After seeing the area around Bryce the adventure turns to Zion National Park. 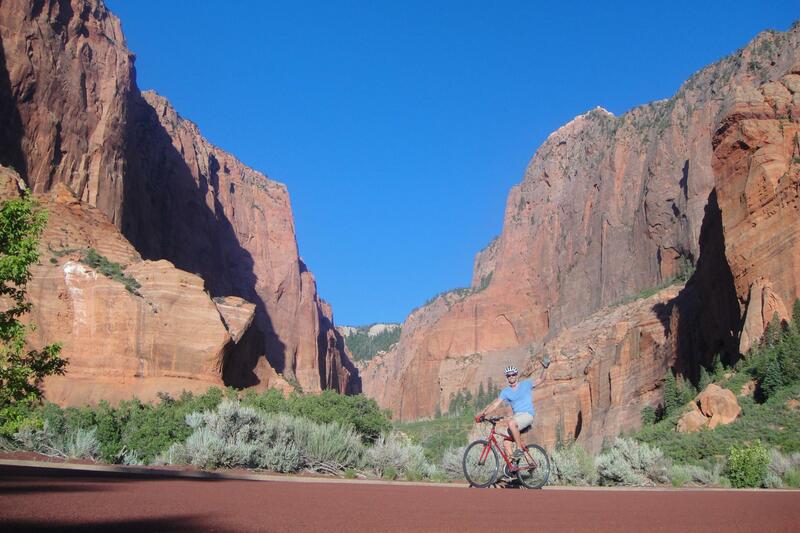 Cycling the Zion Park Road and exploring the surrounding canyons takes you on a surreal journey through time. Often called “a Yosemite dressed in red”, Zion offers a green valley floor surrounded on three sides by thousands of feet of sheer red rock. Nights are filled with laughter around the dinner table, reliving memories from the day’s rides and hikes, and colorful sunsets that morph into black skies that magically become aglow with stars. Cycling and hiking activities are included on this tour, but for cyclists ; the hiking is optional. 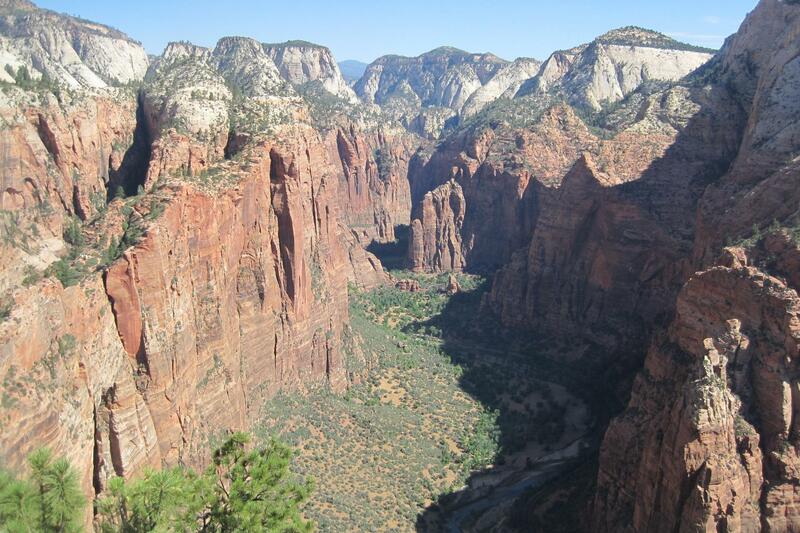 Note that some of the best views and sites in these national parks are only accessed on foot, such as Angels Landing. 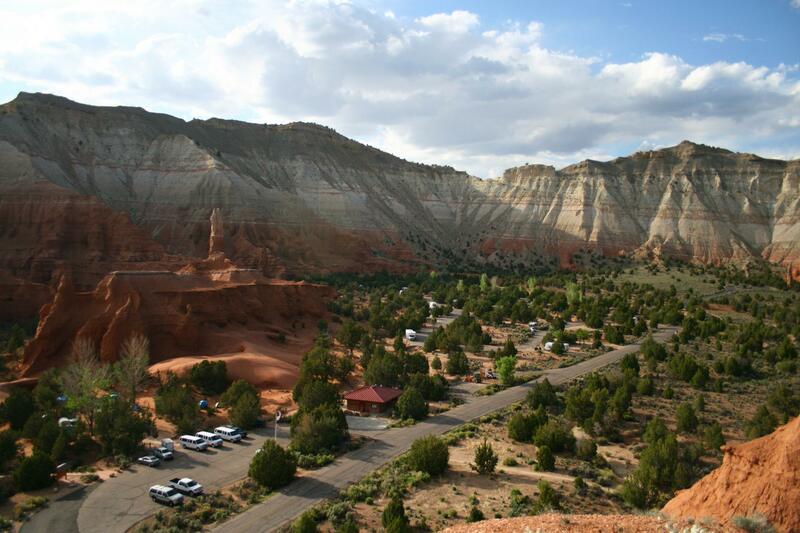 On this trip you will camp at Kodachrome Basin State Park campground- enjoy hot showers, picnic tables, and large camp sites. 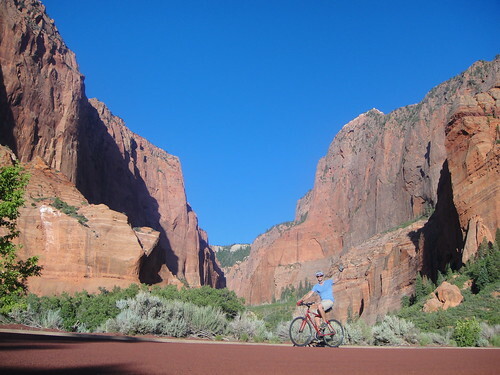 Watchman is just one of several camp options in or near Zion NP. Accommodations: We will be staying in public campgrounds in or near the National Parks we’ll be visiting. These campgrounds have restroom facilities and running water, although Watchman Campground does not have showers so we will walk to pay showers just outside Zion National Park for this part of our stay. We will provide comfortable, inflatable sleeping pads, as well as over-sized nylon tents with full-coverage rain flys. These tents are built for 4 people but will only house one to two people per tent. Your Guides will set up a kitchen in which they will prepare all meals, which will be restaurant quality, served hot, with fresh produce to compliment. Rates subject to model selected; see Bike tab for details or inquire with us about camp gear rentals. - The hiking can be strenuous and Angels Landing does have steep drops from the well maintained trails. Note that hiking is mostly optional for cyclists. START: 7:00am. Meet your guide in the lobby of the Hyatt Place in Las Vegas. Or meet in St. George at 10:30am (inquire for details). END: Drop-off at Hyatt Place in Las Vegas on Day 5 (usually between 3pm and 4pm). Please contact us with questions; or if you have your own group of 4 or more and want custom dates. Our Contact. 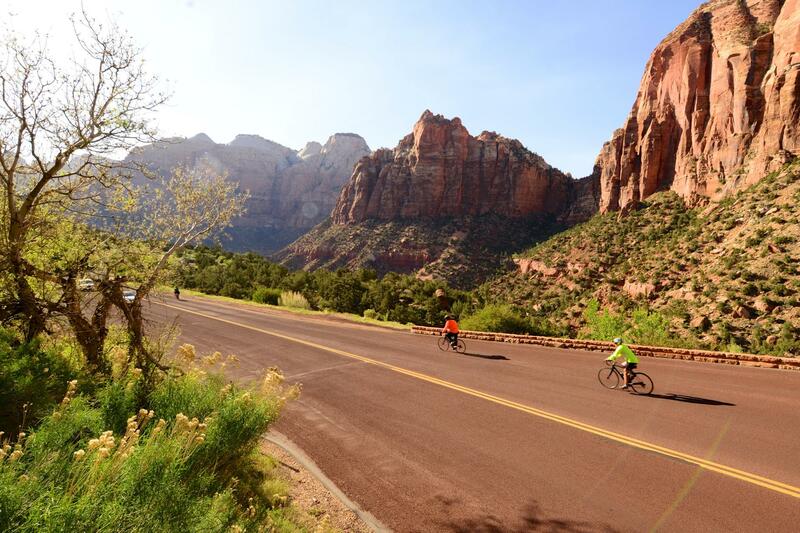 Level 3 - These national parks are mountainous but cycling is on moderate routes all well paved, and hiking is on groomed and maintained trails. 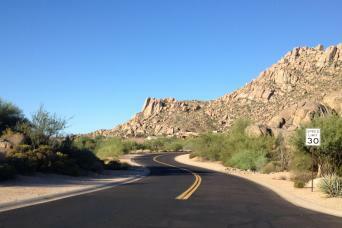 Cycling is from 20-40 miles; and Hiking varies from 2.5-10+ miles; moderate by distance. This tour is recommended for persons with good fitness. We will be staying in public campgrounds in or near the National Parks we’ll be visiting. These campgrounds have restroom facilities and running water, although Watchman Campground does not have showers so we will walk to pay showers just outside Zion National Park for this part of our stay. Your guides will set up a kitchen in which they will prepare all meals, which will be restaurant quality, served hot, with fresh produce to compliment. You can rent any camping gear you don't have or don't want to bring. 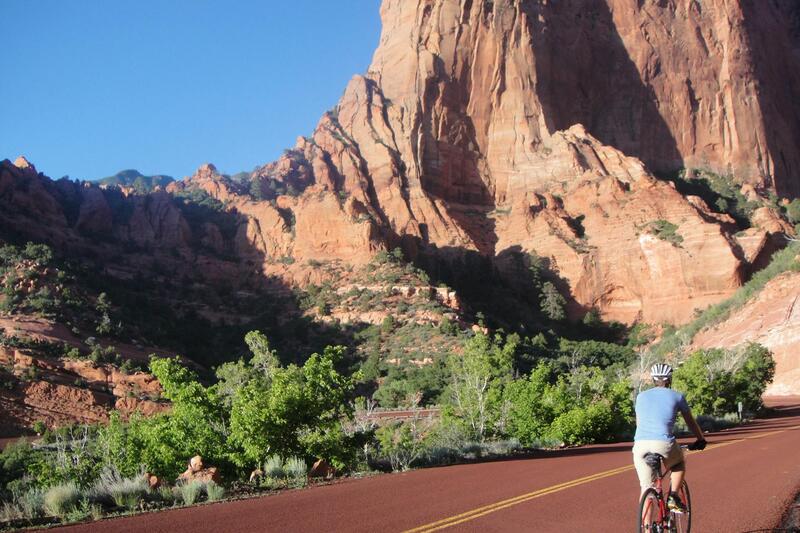 This program combines cycling and hiking and is only available on a guided basis. 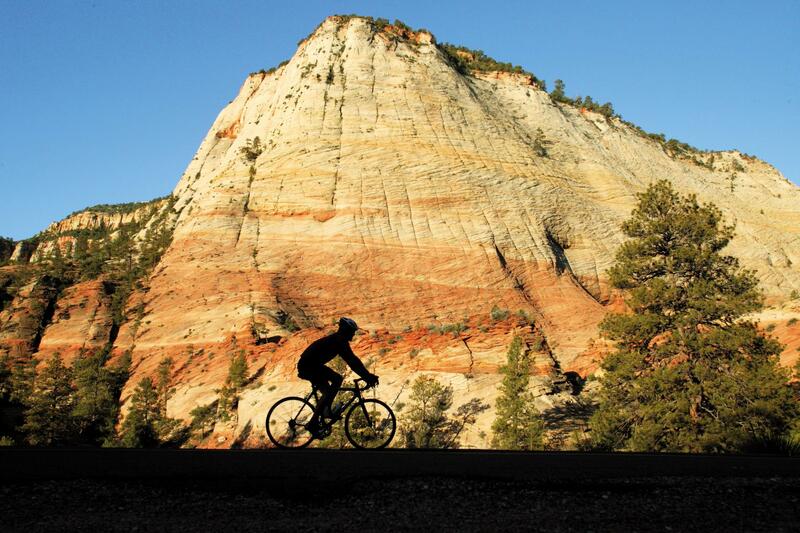 Pure Adventures has partnered with the best local outfitters to build the best cycling tours in the western USA. 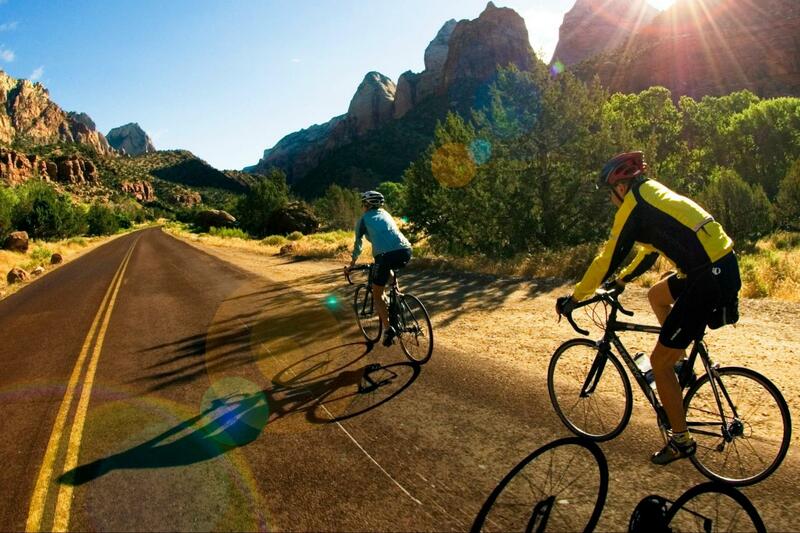 Our team forms the most experienced and knowledgeable cycling tour outfitter in the southwestern USA. Our rental fleet is the largest and highest quality and all of our guides are experienced WFR certified. We have 4+ mechanics on staff and carry the most respected brands. Come experience the southwest with the local experts! Specialized Rouabix SL4 Sport - $225US plus tax for the duration of the tour. Specialized Allez Elite - $160US plus tax for the duration of the tour. Trek Emonda SL6 - $315US plus tax for the duration of the tour. When you rent: Upon meeting your guide at the start of the trip your bike will be ready to ride including a spare tube, CO2 cartridge, CO2 inflator, tire lever, and multi-tool. You will only be responsible for bringing your pedals, shoes, and any other personal cycling equipment (GPS computer, saddle, etc.). Helmets are required on our trips, and you are welcome to bring your own, however, we can provide one for you upon request if needed. You may also send us your stack and reach measurements for the bike to be set up by our professional mechanics. Stack and reach? Huh? No need to worry! If you do not know your measurements we’ll spend some time before our first ride getting your bike dialed in to ensure it’s comfortable and properly fitted to you. Would you like to bring your own bike? You are welcome to do so; and if you wanted to ship it ahead of time or need help building up your bike, we do offer a service to assist you with you own bike and we do have some policies around what we can accommodate. For example, we do not permit tandem bicycles, recumbents, aero bars, TT/triathlon bikes, or unicycles on our trips. To see our complete policy and shipping/travel tipsBike Guide to Bringing your Own bike or you can also Contact us by email. Navigation: Throughout your cycling trip there may be periods of time where you or a small group will be short distances from other guests or guides. To ensure you follow the correct route, we will provide a mobile app that can be downloaded onto your smartphone with the routes pre-loaded for you to follow. Your guide will also have hard copies of maps and cue sheets to pass out if needed. We do not provide any GPS devices or mounting hardware. If you would like to mount your phone to your bike we recommend checking out the Quad Lock mounting system, or you can keep it in your jersey pocket.